The freshest of everything, with a colorful palette of the finest fruits, veggies, cheeses -- an absolute party for your mouth. Oh, and it's all very Eugene-like… All of the art; hold the Birkenstocks. 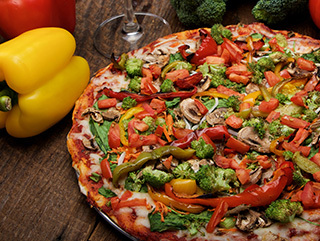 Pizza that keeps our big sister Eugene always celebrating… Home-style red sauce, fresh spinach, sprouts, julienne carrots, green onions, broccoli, fresh mushrooms, tomatoes, roasted tri-color bell peppers, fontina & mozzarella. 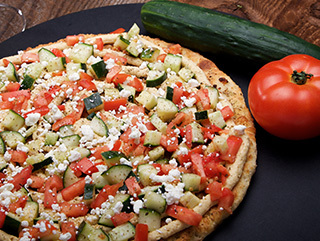 Those dozens of pilgrimages to Israel that brought together the amazing pizza creation the Jerusalem Garden, also offers an even more amazing vegetarian delight, the Jerusalem Falafel. Fresh and flavorful Falafel, made from chickpeas, Oil pressed from the fruit of the olive tree, Za'atar (a beautiful Middle Eastern herb blend), Goat Cheese (Chèvre) & Hummus made from chickpeas, flourishing with salads of fresh tomatoes & cucumbers added after baking, with our special lemon-garlic Tahini sauce. We're bringing all the Garden wonders to life in a bigger way. Shalom. Dozens of pilgrimages to Israel have brought a garden of expectation to this new taste, the Jerusalem. Oil pressed from the fruit of the olive tree, Za'atar (a beautiful Middle Eastern herb blend), Goat Cheese (Chèvre) & Hummus made from chickpeas, flourishing with salads of fresh tomatoes & cucumbers added after baking. 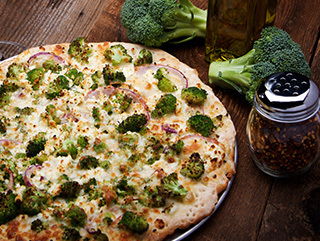 Simple garden ingredients like a mountain of fresh broccoli, & along with onions we add wholesomeness with olive oil, mozzarella & real chèvre (goat cheese) with a dash of red pepper. 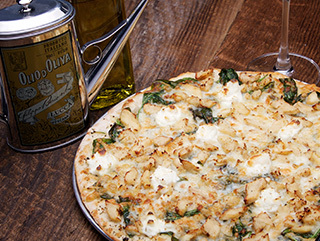 Of course, pizza from the Mediterranean can be quite simple. 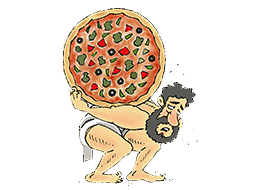 That’s where our piatto, meaning flat or plain, comes in. 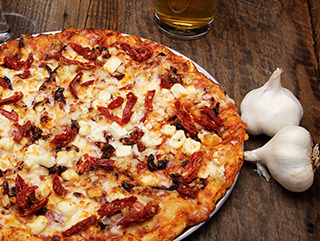 House red sauce, with the simple taste of sundried-tomatoes, roasted garlic, feta & mozzarella. 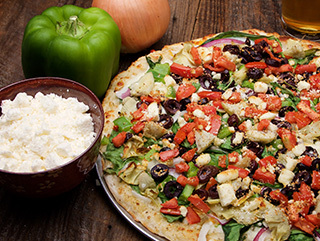 An exquisite garlic-feta-opolis sauce, fresh spinach, onions, kalamata olives, green bell peppers, tomatoes, artichoke hearts & feta. An eccezionale bravo pizza-pie. 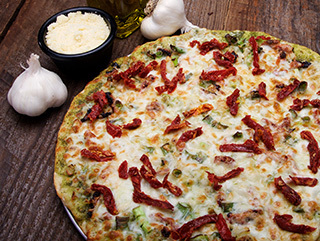 Sweet basil & olive oil pesto, sun-dried tomatoes, green onions & roasted garlic with asiago, romano, parmesan & mozzarella that give meaning to your pizza eating. 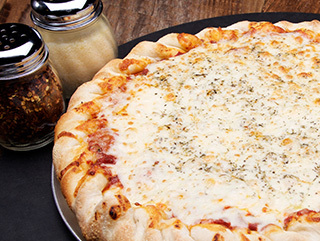 Thick crust recommended. Delizioso with Italian sausage, or try our spicy Italian sausage! 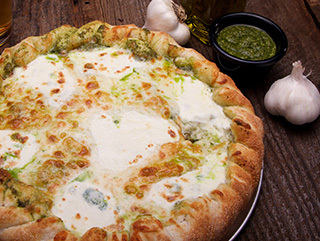 Not a spot of red with a combination of our extra virgin olive oil, herbs, garlic, spinach & mozzarella, fontina, asiago & ricotta. 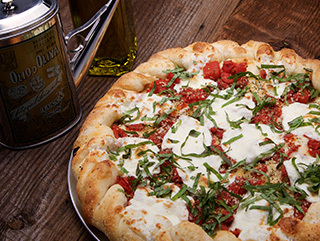 An original Pettine pizza Italian gourmet & Nana’s favorite: home-style marinara, extra mozzarella & our special Italian herbs. Or ask for it Natural without the herbs. 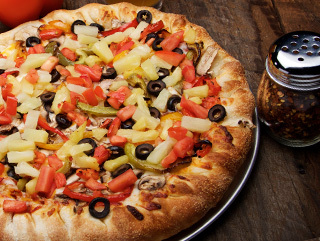 A mountain of the freshest vegetation: tri-colored bell peppers, mushrooms, tomatoes, black olives & pineapple.